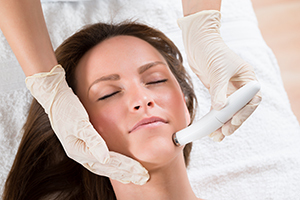 Microdermabrasion is a non-invasive, safe approach to correcting minor imperfections in your skin. Micro crystals are applied to the skin through a hand-piece which also vacuums the dry, dead cells away from your skin showing you a prettier complexion. The procedure targets fine lines and gently smoothes the skin, while stimulating new cell production. In our medical setting, microdermabrasion may be done with a chemical peel depending on the advice of the DiBello Plastic Surgery Skin Care team. Best results are attained with a series of treatments. You can schedule a complimentary skin care evaluation with our clinical staff here at DiBello Plastic Surgery and they will recommend the best program for you.